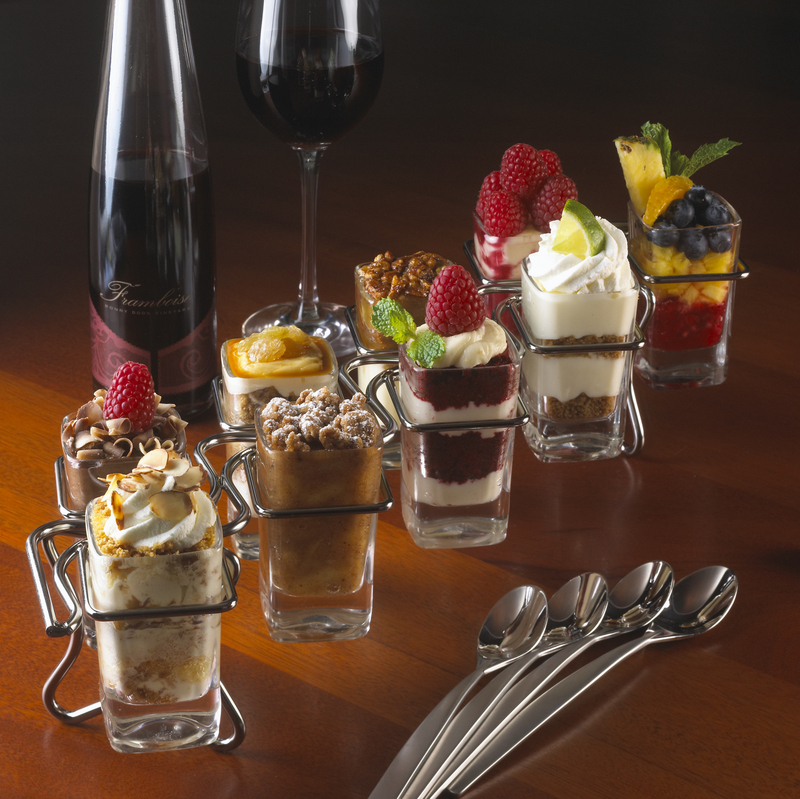 Everyone I know has been raving about Seasons 52. “Fantastic.” “Loved it.” “Excellent.” Even Tom Sietsema of The Washington Post calls the flatbread an “edible jazz concert” in his First Bites review. 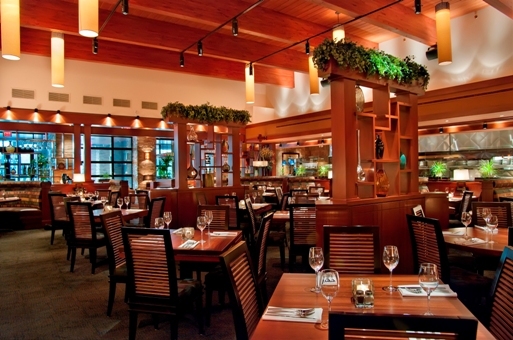 Seasons 52 is a chain owned by the people who brought us Olive Garden and Red Lobster. This causes a bit of skepticism on my part. But I go with an open mind. How can I be a doubter with all the accolades I have been hearing? I am with my husband and six friends. We have subscriptions to the symphony at Strathmore and Roundhouse Theater so we dine regularly in the Rockville/Bethesda area. We are excited to add a new restaurant to our repertoire. 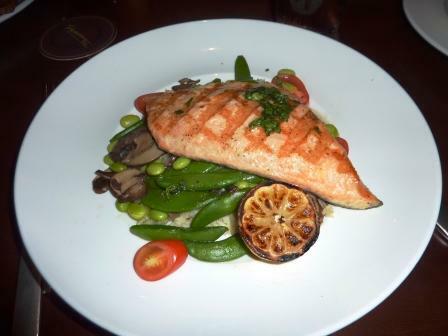 There is a lot to like about Seasons 52 from the get go. The atmosphere is sleek and comfortable. Everything on the menu is 475 calories or less and…seasonal. The wine selection is extensive. The menu selections are almost universally appealing to me. I have a difficult time deciding what to order. I have been told that the flatbreads are a must. I am drawn to the spicy chipotle shrimp flatbread, but more than half of the group doesn’t eat shellfish, and a few don’t eat meat. 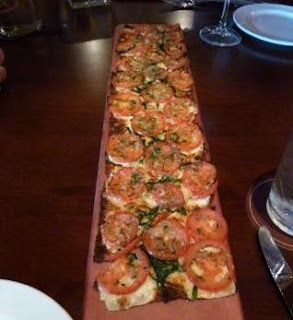 The only vegetarian flatbread on the menu is the Ripe Plum Tomato Flatbread with fresh basil, roasted garlic and melted Parmesan cheese. This is a must. We don’t want two of the same thing so we opt for a special – the spicy pork flatbread- without the pork. The spice on our no-pork “spicy pork” flatbread must be in the meat, as this is a zero on the spice scale, as opposed to the five that our server warns us about. Unfortunately, both of the flatbreads are lukewarm. We all agree that they are okay but nothing special. I am guessing that I would have been happier with one of the other flatbread selections (next time I’ll get the spicy chipotle shrimp). Two people at the table have the Farmer’s Market vegetable soup. They are happy with this dish and in retrospect like it better than their entrees. I have the caramelized sea scallops which are grilled and served with roasted asparagus and tomato-mushroom pearl pasta. The sea scallops are cooked perfectly and the accompaniments are nicely done. I am pleasantly surprised by the portion size. I am expecting the calorie count to result in miniscule dishes and this is not the case. What I am missing though is distinguishable flavor. The scallops could use some punch. My husband and a friend each have the arctic char special and they both declare it “fantastic.” I have a bite and wish that I had gone with this dish instead of the scallops. It really is quite flavorful. Two friends have the maui tuna crunch salad, which is presented beautifully but is not filling enough for dinner. Two people also have the cedar plank roasted salmon and concur with my assessment of the scallops…cooked perfectly but would have liked the flavor to be kicked up a notch. I love the desserts in a shot glass. I have the key lime pie- which is refreshing and not too sweet. It’s a great ending to the meal. Seasons 52 will never be a destination for me if I have the option of dining downtown. However, it is a perfect choice for before theater or a movie in Bethesda, for meeting friends when I don’t want to drive downtown, and for lunch when I want something a little more upscale. I am grateful to the restauranteurs who are bringing new options to those of us who live and work in Montgomery Country. As long as the quality remains high and prices are reasonable (which I think is the case at Seasons 52), these new venues will remain popular. 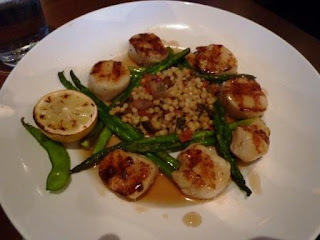 I had the scallops last night at Seasons 52, they were amazing! I have to say that I have been back a few times since I wrote this review and have fallen in love with the duck salad.